AP Limited Editions presents a Writer's delight in the snapshot view of an adorable Black Bear cub hugging the bark of a Beech tree. 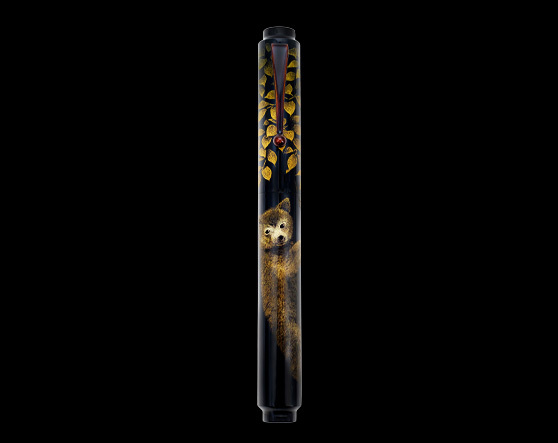 This beautifully crafted fine writing instrument, is a superb expression of the skill of the Chinkin Artist, where fine lines and dots are carved by hand on an Urushi surface to create the body of the furry bear, the tree and the foliage. Once the design is meticulously etched through this process, it is sprinkled with different types of Gold, Silver, Platinum powders and then finished through a lacquer process. The furry body of the Bear Cub is very brilliantly captured as is the snub nose and eyes of the lovable creature. The leaves of the Beech tree are crafted with precision in gradation from subtle to bold. The clip of this fine writing instrument is also specially crafted through several steps involving the application of colored Urushi and several layers of different colors of transparent lacquer perfected through a process known as 'Roiro', a method that creates a brilliant, mirror like finish. AP Limited Editions invites you to explore the enchanting Beech Forest with the adorable Bear Cub.